We are now accepting applications of interest for leasing with us your Senior year 2021/2022. It's not what we say but more importantly what we do. Our pride and passion is demonstrated in each of our developments. We strive to conduct our business in a manner that provides a positive experience for students and their families as we cater to their overall housing needs. Located blocks from the heart of the Notre Dame Campus at the McErlain/George intersection and off Ironwood. The development includes 14 single family type homes with four distinctive exterior elevations. 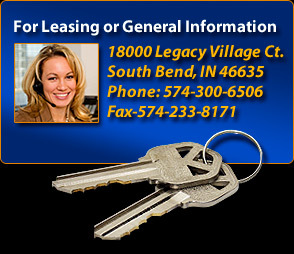 On-Site Office to better serve our tenants Located Lower Lever of Holland Insurance building adjacent to our Community. Hours: M-Th 10-2, Fri 10-12. Read what what our first year students and parents are saying about "Legacy Village."